Agio paper and Industries limited is in portfolio of Subramanian P. He is one of the top investors in India. I have clubbed it as Penny stock based on Company market capitalization and price performance. I was unable to find website for this company. There is lack of information about it on Internet as well. The company has paper mill in Bilaspur Madhya Pradesh. This is the only paper mill the company has. It uses non-conventional raw materials like rice straw and jute waste. It produces writing, printing and industrial paper for packaging. This business area does look promising. It means production of paper from non conventional raw materials instead of plant pulp. So it is environment friendly and will see interest from Government as well. The vertical does look promising but has the company utilized the opportunities. The answer to this question will be answered by Stock price of the Company as per founding principles of technical analysis. Now lets look at stock price performance of the Company over a period of time.This will give us an idea how well company has performed over the years. Note I have taken time period of 16 years so as to remove any cyclic impact on prices. 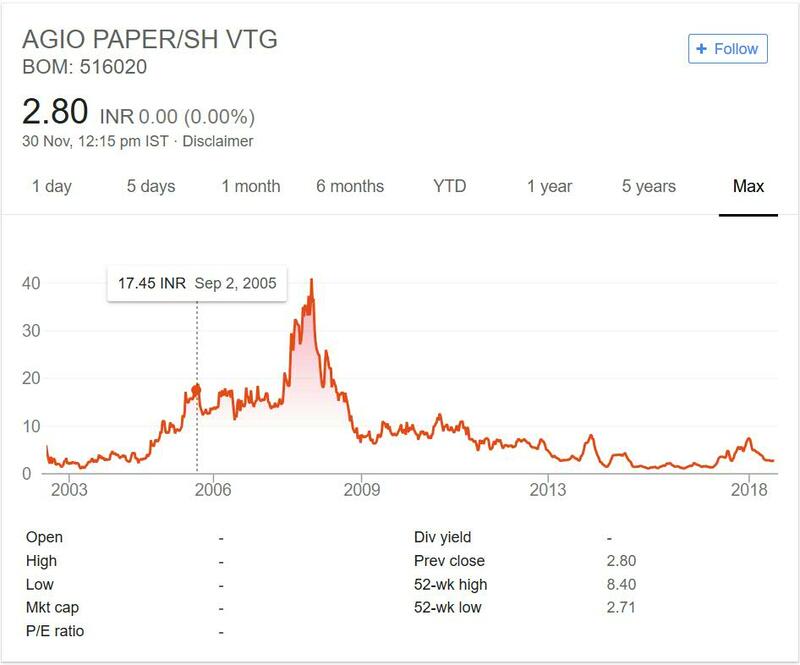 In year 2002 the company was trading at price point of below 10. During next 5 years or so the Company has performed exceptionally well moving past 40 mark. It was good time for investors and they made good money in the counter. During 2008 crisis the stock prices suffered. Still it traded above 10 mark or close to it. But since then it has not performed well. The company has always traded below 10 mark. During last decade company has destructed investor wealth slowly. It gave them 3 fold return in you see last 5 years only moving from 2 odd levels to 9 levels. Agio paper and industries have not performed on stock exchanges for long. The company has not grown. It is an old company. But the performance or growth does not justify the age of the company. People have made money in this counter by investing at low levels. But prediction of levels is not possible or very difficult for most investors. So I would not recommend you to invest in this counter. Penny stocks should have slow movement or consolidation and growth in business over a period time. If this is not the sign then it is better to ignore that company. It has destroyed wealth in this period. I would recommend to stay away from this counter even if eminent investor have put money into this counter.